Today’s featured writer is Brianna J Muir, a writer based in Canberra, Australia. Hello! 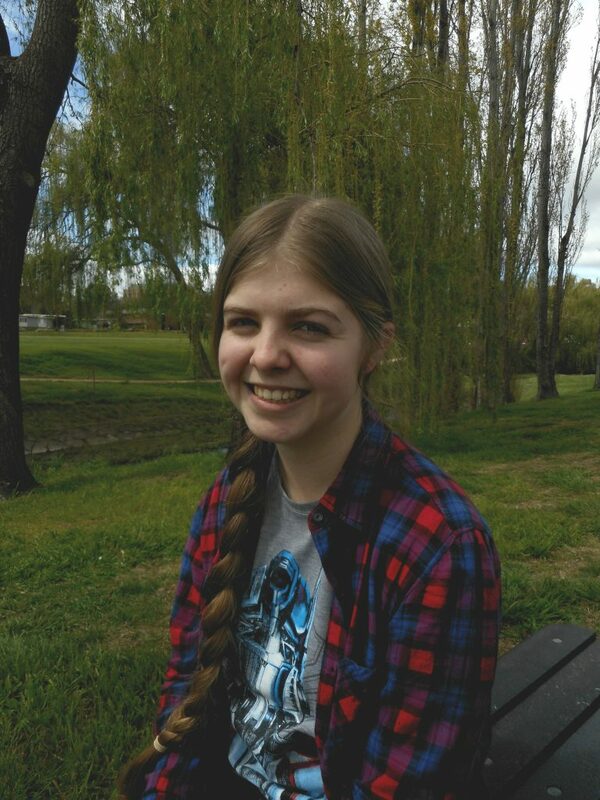 I’m Brianna, a young writer from Canberra, Australia, where I’ve rather boringly lived my entire life (so far). Looking at the other interviews, I seem to be on the younger side compared to the other writers; I’m only nineteen. I still have a lot to learn when it comes to writing, and jump at every chance I get to build my experience. I mostly write prose short stories, although I have been dabbling in a range of poetry and longer forms recently. Currently, I’m studying Archaeology and English Literature at the Australian National University. I also work at the National Science and Technology Centre (Questacon); an absolutely awesome science centre inspired by the Exploratorium. When I’m not studying, working, or writing, I like to paint, watch movies, and travel. For about four years now. I first started creative writing when I was fifteen, but only seriously started when I was seventeen. I was lucky that during years eleven and twelve I was able to take writing courses at my college. I’ve continued writing since then, attending writing workshops and classes where possible. Such a difficult question! It’s impossible to pick just one. I adore Markus Zusak’s writing style, and his novel, The Book Thief, is my favourite novel of all time. It’s a testament to the power of words, and those who are inevitably harmed by war. I also enjoy the Song of Ice and Fire series by George RR Martin, and the amazingly interconnected and intricate world he created, and his ability to sustain it. In terms of more recent novels, I’ve really enjoyed Ryan Graudin’s Wolf by Wolf, which is set in an alternate history were the Axis won the Second World War. I love the style, and the setting is engaging as well. It really depends on the project, but mostly of the time it happens the same way. Once I’ve brainstormed the central idea, I just jot down notes until I have enough to begin. This can take a while sometimes, but I try to start on a draft as soon as possible. After I finish a draft, I leave it and try to forget about it for a month or two, deadlines permitting. After the time has passed, I print out a hard copy, and comb through it with a red pen. Reading my pieces in retrospect, I notice more mistakes, weaknesses, and things I can cut than I would have had I started editing straight away. Because of this, the final product can look quite different to the original, but is generally a stronger piece. Your story in All The King’s Men is a short story entitled Coppertown, a piece about a mining town trapped in the oppressive aftermath of a bloody war. Can you tell us where this story came from, and what it means to you? The idea came to me after seeing the prompt for the anthology: that sometimes it’s impossible to mend what’s broken. The strongest image I had was of a city, literally broken down the middle. I worked backwards from that, also incorporating the idea of never being able to go back. I developed the piece from there, and eventually ended up with Coppertown. With the piece, I wanted to explore how victims of war get on with their lives in the aftermath of catastrophe, and how they push back against oppressive systems. The piece means a lot to me, both as a story and a piece of writing. Although I’ve had shorter pieces published before, this is my first major publication, and the longest piece I’ve written in a while. I also got to explore themes I haven’t had the chance to before, which is always challenging but exciting. In terms of your writing, you’ve dabbled in a few genres. Do you have a preferred genre to write in? In honesty? Not really. It’s so much fun to jump around between genres, or even blend them. That being said though, I do keep coming back to science, speculative, and supernatural fiction and themes within my pieces. I like adding an element of the unnatural and impossible to my works, often in an otherwise ordinary setting. More recently, I’ve also noticed I’m taking more inspiration from ancient history and classics. But I’ve always had an interest in mythology, so it’s probably unsurprising I’m exploring it more in my work. You’re currently studying at university, and also hold down a regular job. What’s your approach to time management? How do you find time to write? It’s tricky to find time sometimes. If I have a writing project I’m currently working on, I schedule one hour or so a day to work on it, with no interruptions. During busier times, or when I have no particular project, I still force myself to write something every day, even if it’s not much or not my best. I also carry around a notebook with me wherever I go, so if inspiration strikes me somewhere inconvenient (like the bus) I can still write something. I have a few projects I’m working on at the moment. While I mainly write short stories, I have two novellas in the works, one of which focuses on the women of the Trojan War. I also have at least five shorter length pieces I’m chipping away at, and I’m always on the lookout for competitions or anthologies to enter. Hopefully, I will have had the opportunity to attend more writer’s workshops and conventions, to further my skills as a writer. In terms of publishing, I’d love to have more pieces published; in magazines and anthologies. I would also like to someday write a novel, and hopefully get it published as well. We here at ATKM HQ think Brianna is a writer worth following.